These papers by Prima Marketing have got to be some of my favorite ever! Tammy really hit it out of the park with this this Deluxe Kit﻿. The colors are so lush.The embellies are so sparkly and fun. These pages almost made themselves! I just love the way the florals all works so splendidly together! I'd been wanting to scrap this photo for so long and the colors in this paper matched her little jumper perfectly. 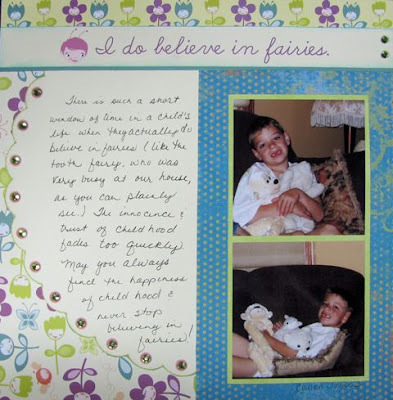 I just love the lines on this paper ~ it makes journaling a snap! I think this last page is my favorite out of the bunch. I very rarely cut my photos into shapes but I really wanted to retain the feel of a flower that this paper had. So I made my messy little sweetie the center of the flower by matting her photo in 1/4 inch larger crircles. I used the scraps to make a couple of cards. Wow, it has been forever since I posted but real life intruded and I can't say that I liked having to work 12 hour days for the past 2 months! But I am getting back to part time and this adorarable kit by Cosmo Cricket was my first grab. PixieLicious is the easiest kit I have ever worked with! 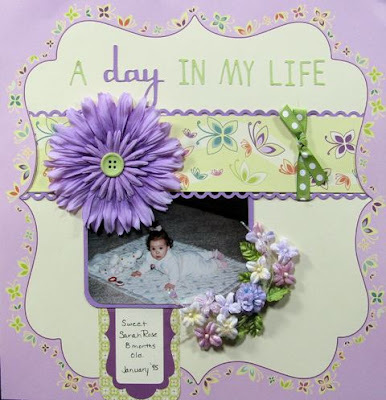 Every sheet of paper in this kit has the most amazing color and the embellies Tammy has put with it are simply divine! LOVE LOVE, LOVE the color in this first layout! The strips of titles in this kit make it super easy to whip together a page. I put these three pages together in one afternoon! For this last page, I wanted to see if I could make this paper look a little less girly and us it for one of my sons layouts. I used a strip of aqua patterned paper I had laying around to tone down the girly feel of this paper and I think it turned out great!